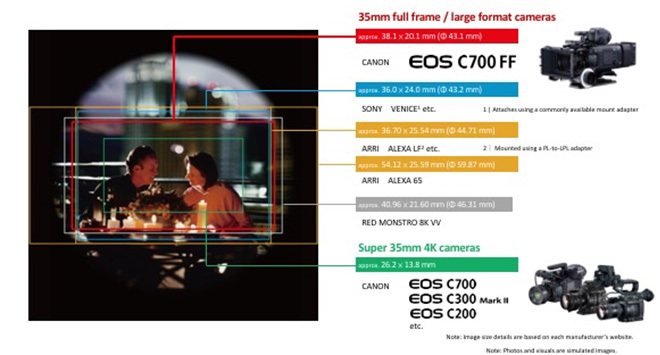 Tech Explained: Learn The Science Behind 4K Optics. Sumire, pronounced "Soo-mee-ray," is the name of a Japanese flower, and like the petals of a flower, our lenses are most beautiful when fully opened. This is the inspiration behind the Sumire look. The Sumire Prime CN-E35mm T1.5 FP X lens offers a compact, consistent lens design and proven Canon lens elements for performance and reliability in professional shooting environments. Intended for the working professional, Sumire Prime CN-E35mm T1.5 FP X lens has markings on angled surfaces on both sides of the barrel, making it easy to read focus and aperture settings from behind or from either side of the camera. Focus markings can even be switched from standard labeling to metric. The control rings are engineered to maintain the proper amount of resistance with consistent operating torque. Designed to fulfill contemporary 4K production standards, it features a full-frame imaging circle in a lightweight, compact design. This phenomenal lens is also perfect for any number of applications. It also features an 11-blade aperture diaphragm for beautiful background blur and innovative glass construction that counteracts barrel expansion and contraction to avoid temperature induced marking discrepancies. Canon's brilliant Sumire Prime lenses offer spectacular optical performance for demanding high-end productions. Sharing the same gear position, front diameter and rotation angle, the lenses' compatibility with third-party accessories allows crews to easily change lenses without making adjustments to the rig setup. Perfect on the EOS C700 FF, these lenses are designed for use with the latest full-frame and Super 35mm PL-mount cameras from leading manufacturers. The CN-E35mm T1.5 FP X Sumire Prime Lens introduces a unique optical design with a nuanced look as the lens aperture approaches its maximum setting – subtly modifying the textural renderings of the human facial close-up. It also smooths the transition to the fall-off portions of the scene resulting in pleasing bokeh. The lens features a large diameter aspheric lens and anomalous dispersion glass, working to deliver high resolution imaging from the center of the image to the outer edges. This helps bring out the high quality of 4K cinema images. The lens produces warm color tones that help to softly capture facial expressions and enable better depiction of textures captured through the lens. Operating at T1.5 allows users to shoot brighter in low-light settings and with softer and greater bokeh. Canon’s color science has become highly refined over generations of lens designs, paying the closest attention to a pleasing skin tone reproduction. 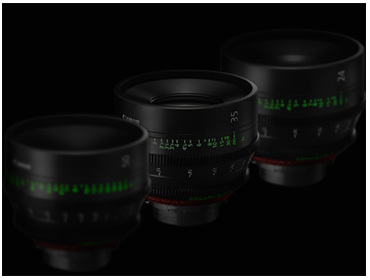 The Sumire Prime CN-E35mm T1.5 FP X can be used interchangeably with other Canon Cinema lenses during the same production since they all have the same warm color characteristics — making it easier to maintain consistent color when multiple lenses are used. The lens has been designed to minimize variations in the angle of view while focusing, a phenomenon known as focus breathing. This feature is extremely important while focus pulling, where changes in the angle of view due to focus breathing could become apparent to the viewer. The Sumire Prime CN-E35mm T1.5 FP X covers full-frame and Super 35mm sensors and works well with today’s full-frame cameras from leading manufacturers. 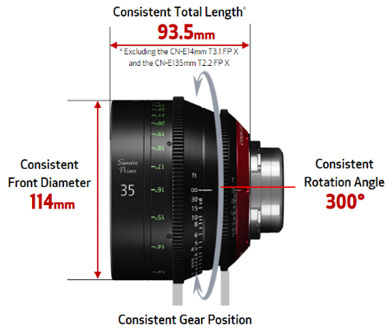 The Sumire Prime CN-E35mm T1.5 FP X features an 11-blade iris. This produces artistic and beautiful out-of-focus areas, creating a more three-dimensional bokeh with a deeper depth of field that a super wide-angle lens can offer, broadening the range of visual expression. 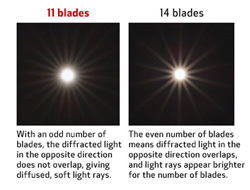 The use of an odd number of blades also helps reduce flaring of specular highlights. Additionally, the iris ring is mechanically controlled with no click stops for smooth exposure adjustments while recording. Designed to meet the needs of professional cinematographers, the Sumire Prime CN-E35mm T1.5 FP X features a unified front diameter (114mm), rotation angle (300°) and gear position on the focus and iris rings (making lens switching quick and convenient) across our entire Sumire Prime Lens series. The control rings work to maintain the right amount of resistance and operating torque in order to help provide the camera operator or assistant with a consistent feel and predictable lens operation. In addition, matte boxes and accessories can be used even after switching lenses. To allow for additional ease of use and flexibility, the Sumire Prime CN-E35mm T1.5 FP X features threading on the front of the lens to accommodate 105mm screw on filters. This feature allows the camera operator to add filters over the lens without the need for a matte box to be attached to the camera system helping to provide flexibility in filter choice as well as the ability to shoot in a more streamlined format. Distance indicators are displayed on both sides of the lens. To improve visibility in nighttime and dark area shooting, indicator markings with phosphorescent paint have been adopted for the front barrel (for right-side viewing). Image shown in the center is of the CN-E35mm T1.3 FP X. (Minimum Object Distance) 0.20m / 8in. 0.3m / 12in. 0.30m / 12in. 0.30m / 12in. 0.45m / 18in. 0.95m / 3ft. 2in. 1.0m / 3ft. 3in. Approx. Size (WxHxL) 4.66 x 4.66 x 3.70 in. (118.4 × 118.4 × 94.0 mm) 4.66 x 4.66 x 4.0 in. (118.4 × 118.4 × 101.5 mm) 4.66 x 4.66 x 4.0 in. (118.4 × 118.4 × 101.5 mm) 4.66 x 4.66 x 4.55 in. Canon's brilliant Sumire Prime lenses offer spectacular optical performance for demanding high-end productions. Sumire, pronounced “Soo-mee-ray,” is the name of a Japanese flower, and like the petals of a flower, our lenses are most beautiful when fully opened. This is the inspiration behind the Sumire look.